We all know what an annoyance it can be to have zero privacy. If you’re sharing rooms with someone, chances are that you would like some privacy, but rooms are only that big. Thankfully for us, a new innovation by Privacy Pop holds the answer to all of your privacy needs. That innovation being the Bed Tent. 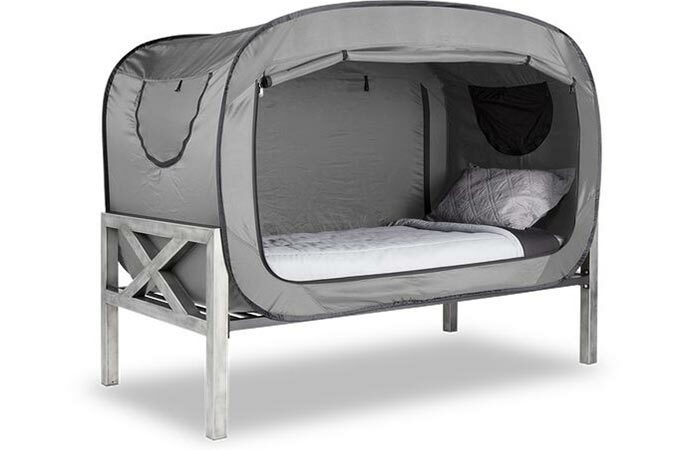 The Bed Tent offers privacy, solitude, and seclusion in a variety of different scenarios. Be it for playtime, bedtime, or simply, alone time. The roll-up doors and windows gives you easy access to the bed itself. The Bed Tent was also designed to be used with your existing mattress or bed base, or it can also be used by itself. This means that you can create a sleep space everywhere; including shared rooms, dorms, or even barracks. The windows and the doors can also be zipped closed to reduce any ambient light that might enter; this increases your sleep time and also reduces the chances of a rude awakening. Check out the video below. The doors and windows can also be zipped closed for increased privacy, and ambient light exclusion. The Bed Tent can also be ordered for commonly found beds, including, Toddler, Twin, Twin XL, Queen and King. For added privacy, and convenience, all of the doors and windows can be rolled up, out of your way, or it can be zipped closed for complete privacy. If you wanted some air, just like with an ordinary tent, the windows and doors come with mesh windows. It can also be purchased in a variety of color options to suit your every style and need. 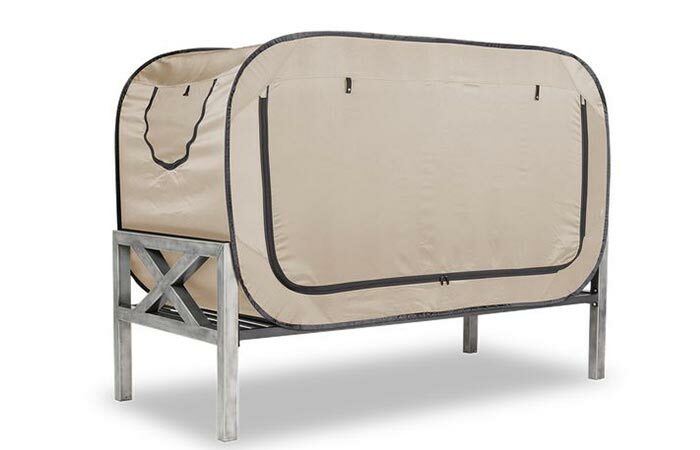 Check out some of the awesome beds we’ve got here to go with your Bed Tent here.